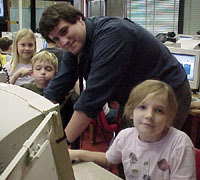 Click on the student activity to download the file or launch the website. Fourth grade students made an acrostic for the word Autumn using a Kidspiration template. 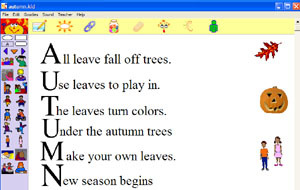 The children wrote sentences or phrases beginning with the letters in Autumn in the classroom and then typed then into the template in the computer lab. 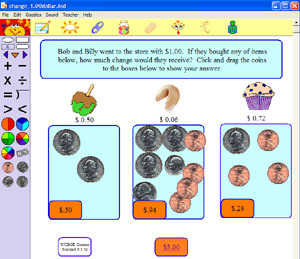 Students will be able to use a computer to determine change for items. "After finishing the lesson with two classes, I have a better idea on how to make it better. I know that I had too many pages to finish in one class. If I were to do it, I would have to use less web pages. The students really did stay on task and were focused on getting the pages complete. I did ask the students what they thought and they said they really enjoyed getting out of the classroom and doing something different. They said they knew it was the same work but in a different environment and they liked that. They all did a great job and the directions were basic and to the point. It was a good lesson and if I had time, I would finish it as well. I just needed more time."